Unknown maker ‘Grand Tour Fan’ 1790-1830, ivory with hand painted chicken-skin, 1950/3/9. Collection of the Sarjeant Gallery Te Whare o Rehua Whanganui. Bequest of Miss F.J. Montgomery Moore, 1950. Currently on display at Sarjeant on the Quay in the exhibition Function & Fancy; Decorative Arts from the Collection and Beyond is one item with a very curious label: a Grand Tour fan with sticks of delicate carved ivory and a hand painted image of St Peters in Rome with exquisite painted designs on its chicken-skin leaves. Why would a fan be made of the skin of chickens? Folding fans originated in China and were first seen in Europe during the sixteenth century. They were luxury items initially only used for royalty but before long the aristocracy and the wealthy were also using the fashionable accessories. Until the early eighteenth century most of the fans in use in England were imported from Italy and France but from 1709 onwards English manufacture began. Fans were usually made of silk until the 1750s when English fan makers began using a superior new product called chicken-skin. Despite its name this strong flexible material was not actually made of the skins of chickens and was in fact a type of fine vellum made from the skins of very young animals. The skins were soaked in a solution of lime and water to clean them and scraped with a pumice stone to smooth the surface. They were then stretched on frames while still damp and a follicle pattern was pressed into them using small round seeds while they were left to dry. When the skins were fully dry the seeds were brushed away leaving an appearance of the skin of a plucked chicken. Larger seeds could be used to create the illusion of turkey or swan skins. While the finished skins were extremely thin and delicate they were also very flexible and durable. 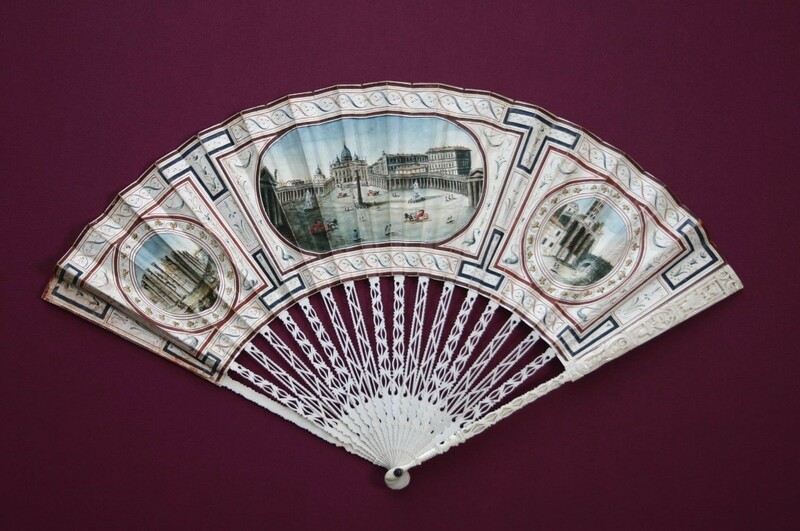 They were ideal for painting onto with watercolour, gouache, or ink without the bleeding of colour which occurred on silk fan leaves, meaning finer detailed painting was now possible, and these fans became very popular as a result. As the eighteenth century closed counterfeit chicken-skin began to be produced using paper (made while drying pressed over small seeds in much the same way as the vellum chicken-skin). The paper fans, with printed or painted images, could be more easily made in bulk at a much lower cost. Counterfeit chicken-skin can be easily identified by holding it up to the light as vellum chicken-skin will show no grain and a slightly mottled appearance. Fans were an essential part of a woman’s dress from the sixteenth century until the late 1800s throughout the whole of Europe and became a very evocative tool with simple fan movements used as a means of communication for messages of love. Some of the most common messages included: “I love you” by placing your fan near your heart, “Yes” by letting the fan rest on the right cheek, , “I am married” by fanning slowly, “I love another” by twirling the fan in your right hand or “You may kiss me” by pressing a half closed fan to your lips. This particular chicken-skin fan currently on display would have been produced as a souvenir of the Grand Tour of Europe, the traditional rite of passage for the young upper class, and was part of a bequest given to the Sarjeant Gallery collection in 1950 by Miss F.J. Montgomery Moore. Also on display is a silk fan painted with courting scenes. The exhibition continues until 21st May 2017.